concussion. Whenever the cochlear hair cells, in particular the outer hair cells, are damaged, by any insult, hearing loss results. Sensorineural hearing loss typically manifests as an inability to understand words or sentences; leading to misunderstandings, frustration, and confusion. People should be aware that a hearing loss, which doesn't go away, can be symptomatic of an underlying condition that needs to be medically treated. Conductive hearing loss is as the name implies. Sound is not being conducted properly from the eardrum through the middle ear to the inner ear. The cause can be as simple as earwax obstructing the canal, a perforated eardrum, a foreign body in the canal, fluid, or serum in the middle ear cavity, a middle ear tumor, or fixation of the ossicular stapes. 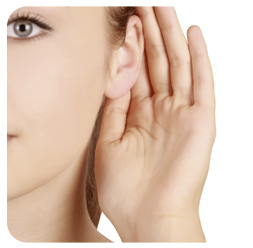 Conductive hearing loss typically presents as a significant loss in volume. Everything sounds too soft. Since conductive hearing loss is almost always treatable, a physician should be consulted if any of the above causes applies to you. Mixed Sensorineural hearing loss means that the patient already had a hearing loss, and then developed an outer, or middle ear condition which exacerbates the hearing loss. and if you experience a sudden decline in your hearing, in either one or both ears, you should see your physician.